A trip to Denpasar takes visitors to the capital of Bali and the gateway to the island. You've added Taman Ayun Temple, Campuhan Ridge Walk, Tanah Lot Temple, and other attractions to your itinerary. You'll get in some beach time at Geger Beach Nusa Dua Bali and JImbaran Beach. Museum-lovers will get to explore Nacivet Art Gallery and Central Wave Painting. Explore the numerous day-trip ideas around Denpasar: Kuta (Balangan Beach & Kuta Beach - Bali), Tirta Empul Temple (in Tampaksiring) and Sacred Monkey Forest Sanctuary (in Ubud). There's more to do: look for gifts at house of nineth life. To find reviews, photos, ratings, and more tourist information, use the Denpasar trip planner. Cairo, Egypt to Denpasar is an approximately 16.5-hour flight. The time zone difference moving from Eastern European Time (EET) to Central Indonesia Time (WITA) is 6 hours. Traveling from Cairo in October, plan for a bit warmer nights in Denpasar, with lows around 28°C. Wrap up your sightseeing by early afternoon on the 6th (Sat) to allow time for travel back home. A coastal area stretching 20 km (12.4 mi) along northwestern Bali, Lovina Beach benefits from a thriving tourism sector thanks to its reputation as a laid-back haven. Kick off your visit on the 6th (Sat): kick back and relax at Eks Beach. Here are some ideas for day two: identify plant and animal life at Wildlife Areas, then take in the spiritual surroundings of Brahma Vihara Arama Buddhist Monastery, and then kick back and relax at Lovina Beach. To see more things to do, where to stay, reviews, and more tourist information, read Lovina Beach trip planner. You can drive from Denpasar to Lovina Beach in 2.5 hours. 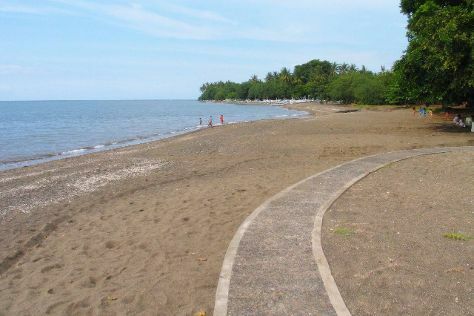 In October in Lovina Beach, expect temperatures between 36°C during the day and 28°C at night. On the 9th (Tue), you're off tohome.